> One of my favorite ways to take an in-city vacation is to spend a day at the Pike Place Market. Now my friend JanMarie Johnson is offering guided tours of the market, combining historical tidbits with delectable “bites” at a dozen of the shops. 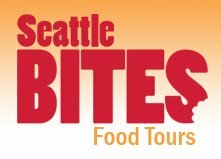 Check it out at Seattle Bites Food Tours. This entry was posted in Uncategorized and tagged Pike Place Market tours, Seattle bites, Seattle food tour. Bookmark the permalink.